Like many other types of wildlife, deer and rabbits have become extremely adaptable to living within human environments. Unfortunately, when searching for food they can quickly lay waste to vegetable and flower gardens. Although physical barriers like walls and fences are the most effective means to keeping them out of your garden, they are not always a practical or affordable solution. "Scent fences" can be a practical alternative - especially when local deer and rabbit populations have plenty of other places to go in search of food. Cat Litter: Create a scent fence with used cat litter by sprinkling it on the lawn and around ornamentals. Replace weekly or after heavy rains. Used cat litter will also help repel moles and gophers when dumped into active burrows. Use caution when handling and distributing litter: Cat feces may contain toxoplasmosis parasites, which can infect humans. Do not use litter around edible plants. If you can't stand the thought of digging cat litter into bare soil, put small amounts into the bottoms of coffee cans that have several holes punches in their sides and set them around your garden. Hair: A lot of gardeners have successfully kept deer and rabbits away by hanging human or dog hair from trees or by spreading it in loose clumps around their landscape. To hang it from trees, use mesh bags with a 1/8 inch or smaller mesh, and place two large handfuls of hair in each bag. Hang the bags at a height of about 4 feet and spaced no more than 3 feet apart. You can also spread wads of loose hair near the base of vulnerable plants. A scent fence of hair works best if you replace the hair at least once a week. Contact local barbers and groomers - most will be more than happy to help out. Deodorant Soap: String bars of deodorant soap on wire and hang them on the branches of the trees or shrubs that need protecting. Space them no farther than 3 feet apart and try to hang them at deer-nose level (about 4 feet). Hint: If you leave the bar soap in their packages they will last a bit longer. 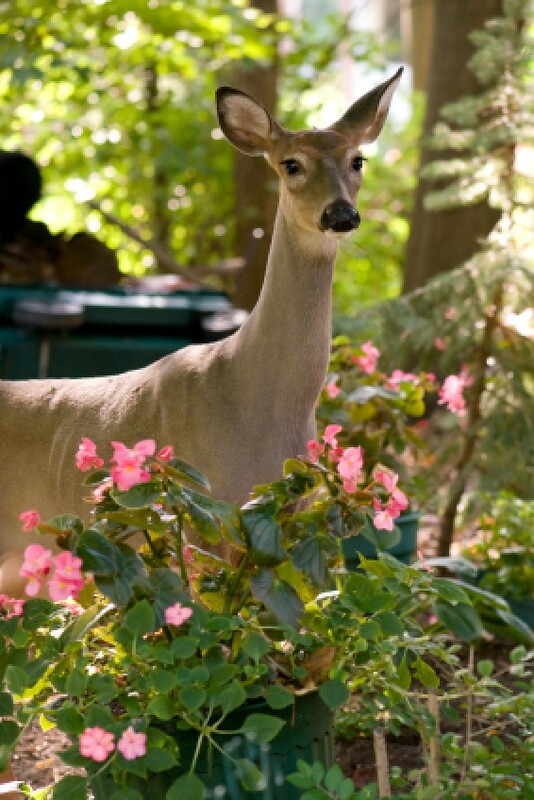 For repelling deer and rabbits from individual plants, try scented dryer sheets. Cut them into strips about an inch wide and tie the strips on the plants you want to protect. Deer especially, do not like the smell and tend to stay away. Mix 3 to 6 rotten eggs (or a quart of sour milk) in 1 gallon of water. Add a teaspoon of garlic powder and 1 teaspoon of finely ground chili pepper. Spray around deer and rabbit-prone plants, renewing after it rains or at least once per month. Many pre-mixed versions of this type of concoction are available at home and garden centers. I highly recommend a brand called Liquid Fence. After just one time of using it on my vulnerable flowers and shrubs, the deer and rabbits have learned to steer clear. Garlic: No one likes garlic breath, perhaps least of all deer. Recent research has shown that selenium, the component in garlic which gives it its garlic smell, prevents deer from eating tree shoots and seedlings. Give your plants garlic breath by spraying a garlic oil solution on trees and shrubs. (Reapply after it rains). As an alternative, plant time-released garlic capsules (available at health food stores) at the bases of trees or shrubs. Homemade garlic oil: Soak 6 cloves of minced garlic in 2 tablespoons of mineral oil for 24 hours. Strain out the garlic and add 1 pint of water to the remaining liquid. Mix well and spray plants. Urine: In the animal kingdom, prey species like deer and rabbits must follow a cardinal rule to survive: avoid predators at all costs. Predatory animals use urine to define their territory. Because the scent of urine is sometimes the only warning prey species have that predators are nearby, when they smell it, they instinctively flee the area. Bottled urine from predators like coyotes, mountain lions, and wolves can be purchased commercially to create a scent fence around garden plants. If you're so inclined, you can also collect and use your own. Vinegar: Some gardeners report that vinegar helps repel rabbits. After enjoying a meal of corn on the cob, cut the cobs in half and soak them in a bowl of vinegar for 10 minutes. Then create a scent fence by scattering them throughout your flower or vegetable garden. Store the used vinegar in a labeled bottle and repeat the process every two weeks. As the odor of your scent fence fades, so does its effectiveness. To keep animals away, you need to keep things smelling "fresh". Always test spray-on repellants in a small area before applying to plants. Plan to reapply your odor repellants after it rains, and after they have spent some time being exposed to the elements. Eventually, the animals may become used to the scent and start to ignore it. If and when this happens, switching to a different type of scent fence can be effective. I definitely agree with Ellen on using scent to deter wildlife. My only suggestion would be regarding the soap. A much less expensive solution is to buy the small drawstring muslin bags sold at feed stores (about 25 cents each) and put a small piece of soap (I like original scent Irish Spring) inside. When it rains the soap permeates the bag and makes the scent stronger. One bar works for many of the bags. As a wildlife rehabilitator I thank Ellen for giving those tips on deterring wildlife without causing them harm and I thank everyone in advance for doing what you can to not harm the wildlife while still enjoying your gardens. Some people are aware that you can use urine to keep deer, and rabbits from eating plants, and vegetables in a garden. Save the containers that seasoning come with small holes in them to release the season. Put the urine or smelly product that you are using as a repellent into the container. Dig a hole, and bury the filled container or containers in your problem area with the small holes section open. When it rains, all of you smell will not be washed away. If you know that it is going to rain you can go outside, and closed to lid until the rain stops. Source: I thought of the idea after reading the tip on ThirftyFun.com about using urine as a repellent for deers, and rabbits in the garden.